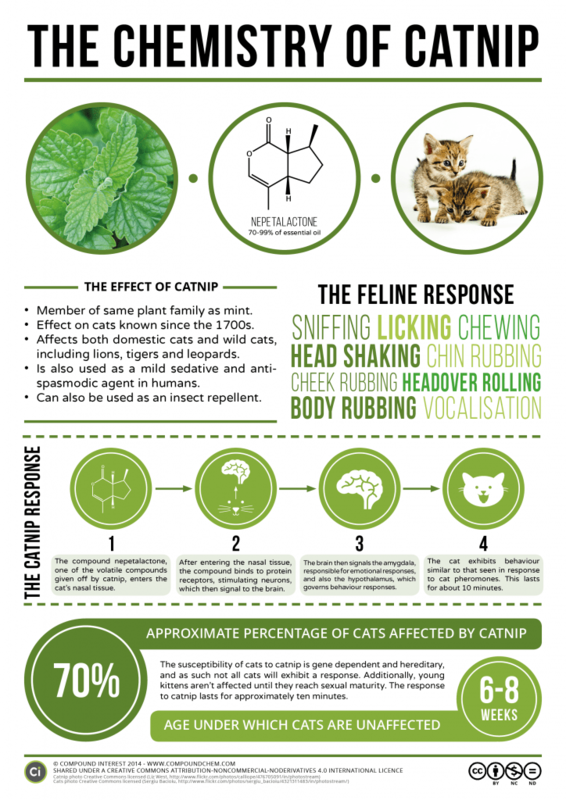 Ever wonder how catnip works? It’s a plant related to mint, and it’s been known for centuries to drive felines nuts. There are compounds and oils in its leaves and twigs, one of which is called nepetalactone. This particular compound stimulates receptors in the cat’s nose, activating regions of the brain that trigger behavioral responses like rubbing, chewing, meowing and salivating. About 70% of cats get a hereditary feel-good buzz from the plant. We know sensitivity doesn’t occur until the cat reaches sexual maturity, because kittens don’t respond to it. It’s also not exclusive to domestic cats, because big cats like lions, leopards and jaguars also dig it. Interestingly, scientists think nepetalactone mimics a pheromone found in male cat urine. As such, the behaviors it elicits look really similar to females in heat. However, both males and females have the same types of responses (hawt). All that rolling and yowling is kind of like a kitty lap dance, however it doesn’t mean that your cat is actually turned on. The behaviors happen whether or not a cat is spayed/neutered, and their crazy antics are likely just a showing of ecstasy caused by brain activity in the amygdala and pituitary regions. Nip – not even once. The good news? Catnip is harmless and non-addictive, so you can let your little buddy gnaw their way through as much of the herb as they please. Most cats will lose interest after about 10min, but will happily come back for more later.